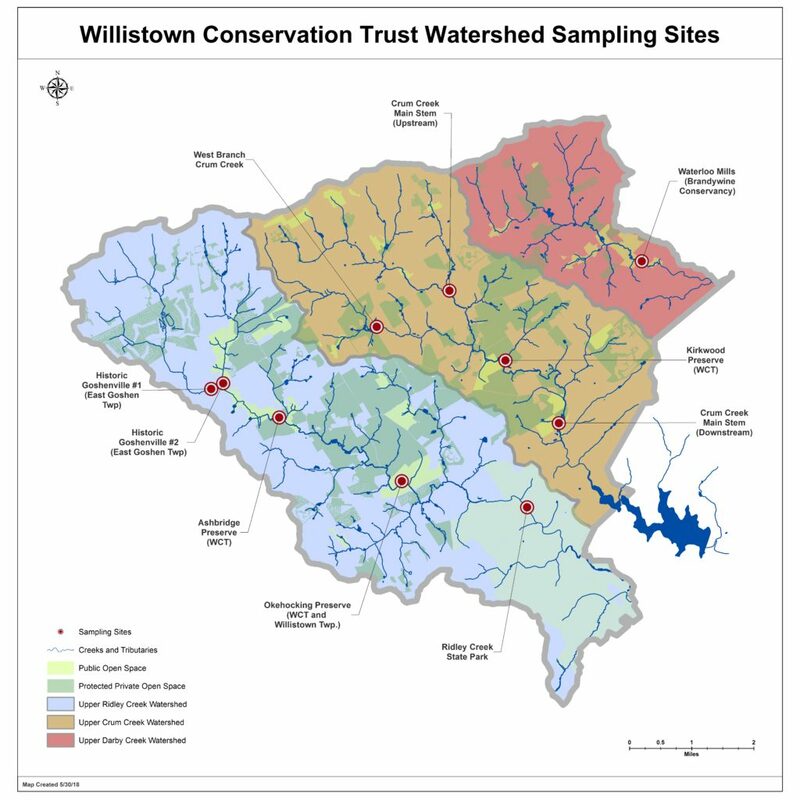 Water quality monitoring research began at Willistown Conservation Trust in January 2018 with funding provided by the William Penn Foundation in affiliation with the Delaware River Watershed Initiative (DRWI). The Delaware River Watershed Initiative (DRWI) is a collaborative effort to protect and restore the waters of the Delaware River watershed. While water conservation organizations across the watershed have operated independently for over a century, the DRWI aligns these groups to work cooperatively, maximizing the scale and impact of their conservation activities. The Trust assists the DRWI by collecting baseline water quality data in the headwaters of the Ridley, Crum, and Darby creeks. With guidance from researchers at the Academy of Natural Sciences, the Trust chose ten sample sites throughout the Ridley, Crum, and Darby watersheds that best described the true condition of the creeks as they flow through a variety of habitats. The Watershed Protection Program collects water chemistry samples from these sites each month, providing enough data to accurately portray stream health over time. Our partners at the Academy of Natural Sciences analyze these water samples for the presence and concentration of nitrogen, phosphorous, and total suspended solids – a measure of solid particles floating in the water – to be used by the DRWI in its conservation efforts. The Watershed Protection Program also surveys its ten sample sites annually for macroinvertebrates, aquatic organisms with no backbone that you can see with the naked eye (e.g., insect larvae and mollusks). Macroinvertebrates vary in their tolerance of pollution. On a gradient of water quality, the most sensitive macroinvertebrates can only survive in the healthiest streams while the most tolerant macroinvertebrates can live even in the most degraded streams. Furthermore, insect larvae can live in the same stream reach for several years before emerging as winged adults. Therefore, any fluctuations in water quality during this maturation period would eliminate the more sensitive species from the stream. The Watershed Protection Program uses macroinvertebrate data to complement its water chemistry monitoring. Where water chemistry samples provide information on stream health for a single moment in time, macroinvertebrate surveys reflect water quality over several years. Through our examination of the conditions across the Trust’s program area, we are then able to make recommendations for land use practices that would lead to improved water for our downstream neighbors.